Rev. Fred Phelps, a “Nemesis Saint”? Topeka, Kansas – Dr. Stephen V. Sprinkle has posted a new article on Huffington Post Religion. You can visit the original article here. Comments and shares from the Huffington Post site are appreciated by all the readers of http://unfinishedlivesblog.com. Rev. Fred Phelps, Founder and former Pastor of Westboro Baptist Church of Topeka, Kansas, is dead at the age of 84. Pundits and regular people are busily dissecting the story and social significance of one of the most venom-filled ministerial lives in American history, as well as the hate-mongering “ministry” the Westboro Church became notorious for doing since 1991. What, however, is the spiritual and theological import of the life Fred Phelps lived and the religious leadership he carried out for better than two decades? What does Fred Phelps teach us about God, and the service of others in God’s name? Dare we even speak of Rev. Phelps as a “negative saint,” the polar opposite of all Christ-like saints, given the carnage Phelps left in the lives of countless queer folk, slain service members, and cultural celebrities he and his flock picketed and condemned to eternal damnation? “Saint-language” seems blasphemous when we apply it to a man’s life so rabidly committed to eliciting the worst from the human spirit and the Christian faith. Nevertheless, every life lived has something to teach us about ourselves and God, does it not? How can we not speak of Phelps as we must speak of ourselves and all others who stand need of the amazing grace of God? Allow me to explain what I mean. We remember the epithets Fred Phelps reveled in. He made “God Hates Fags” a standard feature of modern hate speech. We cannot erase from our minds the images of Matthew Shepard, Billy Jack Gaither, and Diane Whipple writhing in the animated hell fire that Phelps installed on his web site, complete with a background soundtrack of groans and screams to drive home the message that nothing he could imagine could be worse than to be gay and lesbian. We will never know the number of fanatics Phelps inspired by his vileness, nor the multitude of LGBTQ people young and old who felt his criticisms crush their self-esteem and cut into their souls like knives. But we have seen his kind before: Pharaoh, and Saul, Ahitophel, and Judas, to name but a few oldies but baddies. Or Roy Cohn, Senator Joe McCarthy, and “Bull” Connor to name some near contemporary bad guys. I am sure you have your own personal list. Nevertheless, Phelps and his bad seed still wind up serving God just like the best of us. That is the theological sense Fred Phelps makes. His “negative sainthood” shows us that the worst wickedness is, in the end, powerless before grace and mercy. Karl Barth in his Shorter Commentary on Romans (SCR) and throughout the Church Dogmatics (KD and CD) teaches that the Pharaoh of the Exodus who held the Hebrew children in abject slavery with a hard heart ultimately found himself broken upon God, who uses the story of Pharaoh’s human darkness to witness to divine mercy, standing right alongside Moses who testifies to God’s liberating justice. Barth writes, “Therefore Pharaoh too serves ‘the power of God’ (SCR, 73). Barth struggled against anti-semitism and fascism with a theological strength we need to deal with homophobia and transphobia. Like the contrasting pair of Pharaoh and Moses, Barth talks about Judas Iscariot and Jesus. Barth writes that Judas, the “rejected man,” is the best pattern he can find of a person who rejected goodness, going so far as to pronounce judgment on himself, and joining Jesus in death. Yet every “rejected one” remains a witness to God, who in the end shows that the very amazing grace upon which the future depends is also there for the “rejected,” too. Barth declares: “The rejected man exists in the person of Jesus Christ only in such a way that he is assumed into His being as the elect and beloved of God . . . With Jesus Christ the rejected can only have been rejected. He cannot be rejected anymore” (KD II/2, 502; CD, 453). Fred, too! So, does that mean that Pharaoh, or Judas, or Fred get a pass on what they do, thanks to some sort of weak-kneed universalism, the idea that God saves everyone regardless? Barth denied such a possibility: “The Church will not . . . preach a powerless grace of Jesus Christ or a wickedness of men which is too powerful for it. But without any weakening of the contrast, and without any arbitrary dualism, it will preach the overwhelming power of grace and the weakness of human wickedness in face of it” (KD II/2, 529; CD, 477). Fred Phelps and Joe McCarthy and Judas Iscariot must, in the end, answer to the same justice and grace of God their words and deeds rejected when they refused to treat all of God’s children with justice and love. The deeds of the “negative saints” of God are terrible, and it is only right that they should somehow suffer. No one knows what Fred Phelps had to face from his excommunication or upon his sick bed. But Fred and Joe and Judas depend upon and bear witness to the divine mercy, also—just like Moses and Mary and Martin Luther King Jr. Even a “Nemesis Saint” like Rev. 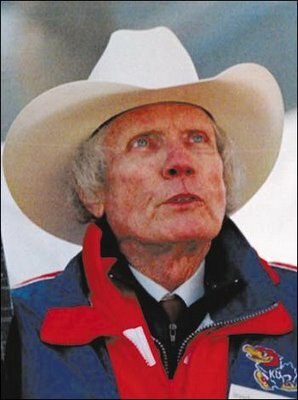 Fred Phelps is a witness to the divine mercy. “Saint” Pharaoh, too. And “Saint” Judas. For all the saints, pro and con, testify to the grace and justice before which we are all alike in utter need. No one I know shows the impotence of wickedness or the need of divine mercy more than Fred Phelps. And in that way, at the very least, “Saint” Fred shows me something mysteriously awesome about the amazing grace of God.